Does everyone from Australia remember the Cheesecake Shop? Apparently it’s still around. My parents always used to buy cakes from them – they made way more than just cheesecakes and everything was delicious. As you can see, my sweet tooth developed early and it’s tough to keep it in check! My favourite cheesecake was easily their ricotta cheesecake stuffed with sultanas. I’m not sure whether it was the ricotta or the sultanas that drew me to this cake – or the combination of both. Sadly, the Mordialloc shop stopped making ricotta cheesecake at some point in my early teens and I was devastated… but I eventually put aside my grief and moved on to my custard tart obsession. A couple of months ago, my friend Chath made a batch of miniature cheesecakes and they got me thinking about the ricotta cheesecakes I’d loved so much growing up. Of course, since I would be hard put to find a gluten free/fructose friendly ricotta cheesecake in the supermarket – not to mention the fact that I like baking – I decided I would make my own. 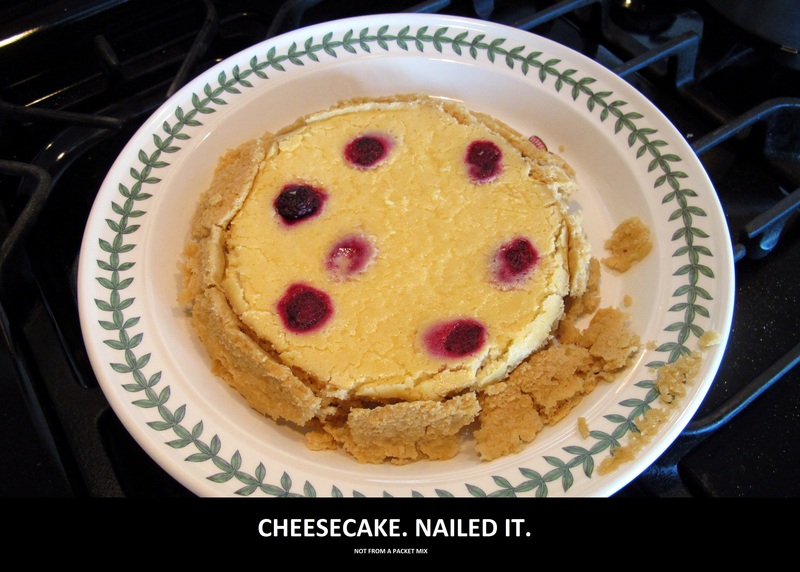 I got my inspiration from a few sources; Chath’s cheesecakes linked above (they are delicious), this classic baked cheesecake from Donna Hay and Alton Brown’s method of water-bath baking cheesecakes from his show, Good Eats. A couple of trials and errors later, I give you my ricotta cheesecake with variations. It is lightly sweetened and combines the best of both the ricotta and cream cheeses for a rich cheesecake that is the perfect balance of fluffy and creamy. Makes 1 x 9″ cake or 2 x 6″ cakes. 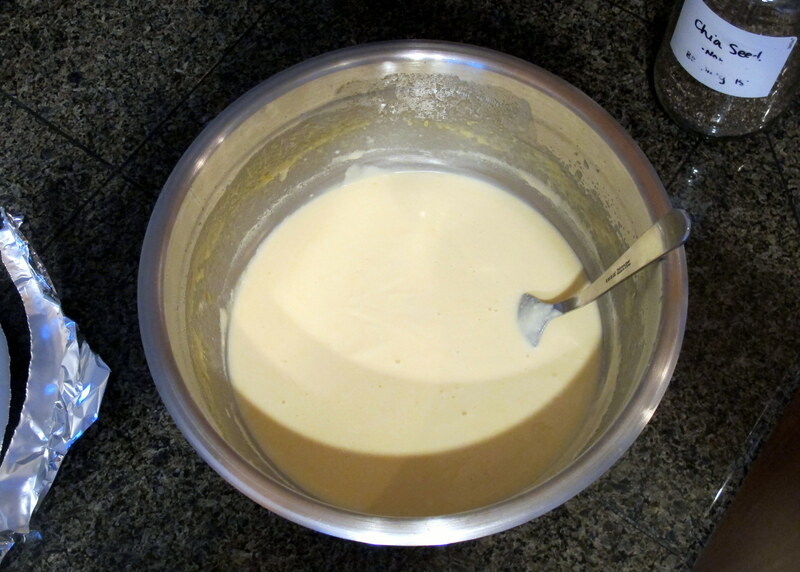 You may not need all the base mixture for the single 9″ cake. Layer the blind baked crust with stewed fruits and dust the top with icing sugar after it has baked. Sprinkle fresh or frozen berries on the blind baked crust and dust the top with icing sugar after it has baked. Stir a tolerable amount of dried fruit through the filling before pouring it into the crust then bake it and dust the top with icing sugar afterward. 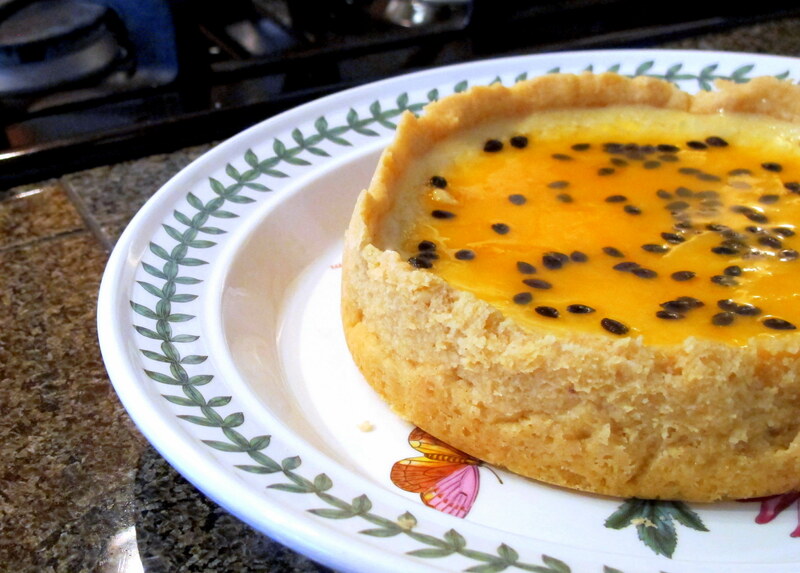 Bake the mixture plain and pour passion fruit pulp or a mixed berry sauce over the top. Bake the mixture plain and dust the top with icing sugar after it has baked. Pre-heat your oven to 150 C/300 F.
Grease and line either one 9″ cake tin (normal or spring form) or two 6″ tins completely. 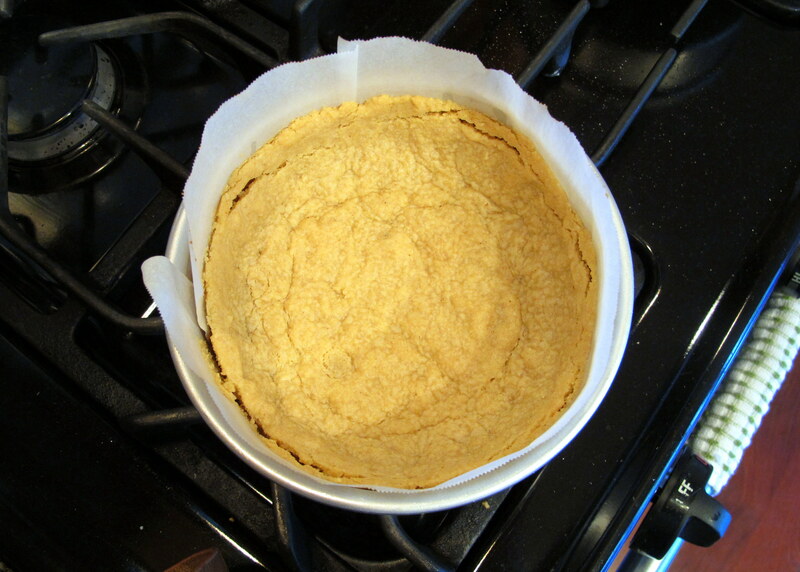 Using baking paper, line the sides first and then press the circle for the base in gently, sealing up the gaps. In a food processor or by hand, thoroughly combine the ingredients for the crust. It should be a smooth, malleable mixture and not dry and crumbly. Press it evenly over the lined cake tin base and up the sides as high as possible, as it will slide down a little when baking. 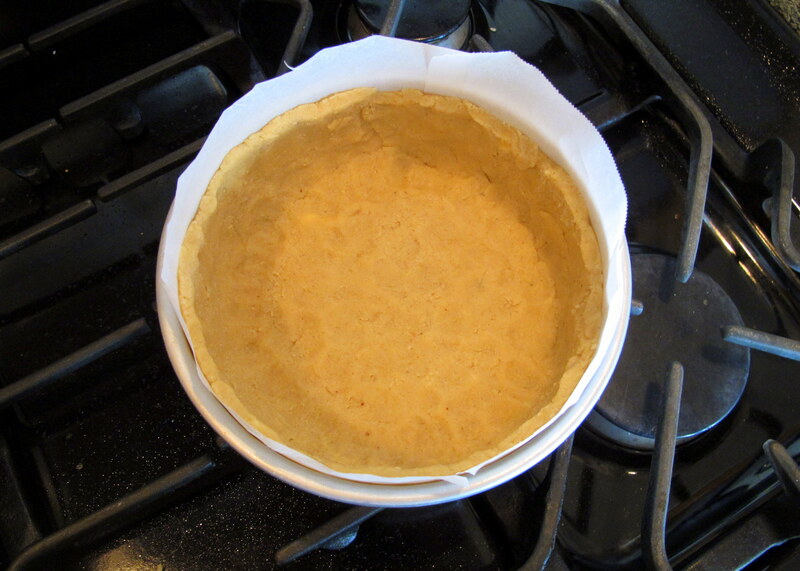 Cover the crust mix with baking paper and pie weights (to help even and quick cooking) and blind bake for 15 minutes or until it becomes lightly golden. Let the crust come back to room temperature. This is where the variations come in – choose your variation and then fill the cooled crust to about 5 mm shy of the top with the cheese batter, covering any fruits you decided to add in. In the photos below, I filled the crusts to 5 mm below the cracks caused by me overcooking them. 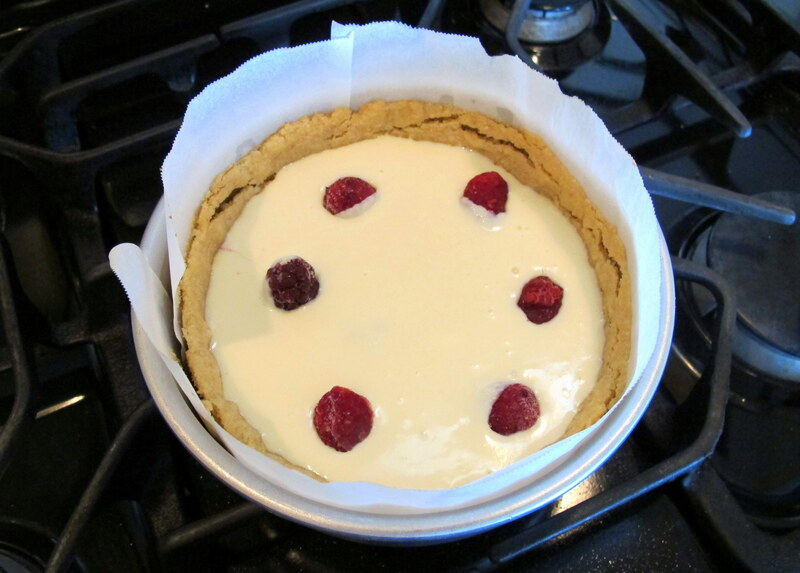 Place the cake tin in a large baking dish and place that dish in the oven. 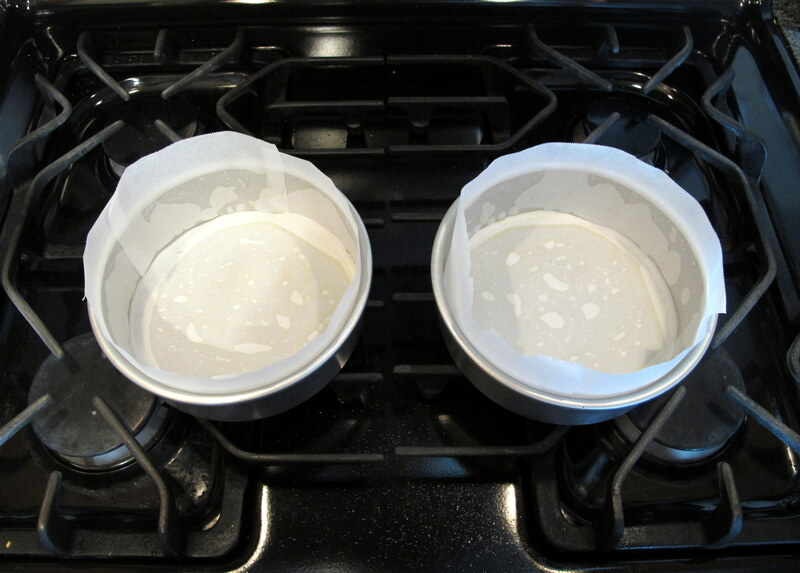 Pour the boiling water into the baking dish so that it surrounds the cake tin up to 3/4 height – this water bath technique allows the cheesecakes to bake slowly and evenly while providing steam to prevent them from drying out, thus eliminating those unsightly cracks from the surfaces that can form as they cool. If you have used a spring form tin, this will not work as the water will leak in. 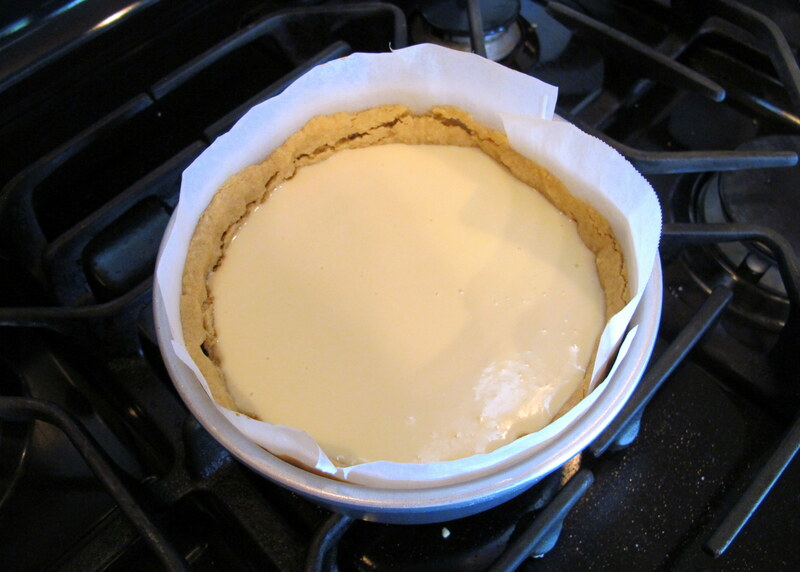 Instead of a water bath, place an oven safe bowl full of boiling water on the shelf under the baking cheesecake to help steam it. 6″ cake – 45 minutes at 150 C/300 F and then turn the oven off. Open the oven door for 60 seconds before closing it again and set the timer for 45 minutes more, after which you can remove the baking tray with cake tins from the oven and then take the tins out of the water bath. 9″ cake – 60 minutes at 150 C/300 F and then turn the oven off. Open the oven door for 60 seconds before closing it again and set the timer for 60 minutes more, after which you can remove the baking tray with cake tins from the oven and then take the tins out of the water bath. Store in the fridge for 3-4 days, max. If you do not store it in an airtight container, your fridge may dry out the surface and a skin will develop. Serve your variation of choice with extra fresh fruit, vanilla bean ice cream or whipped cream to cut the richness if necessary. 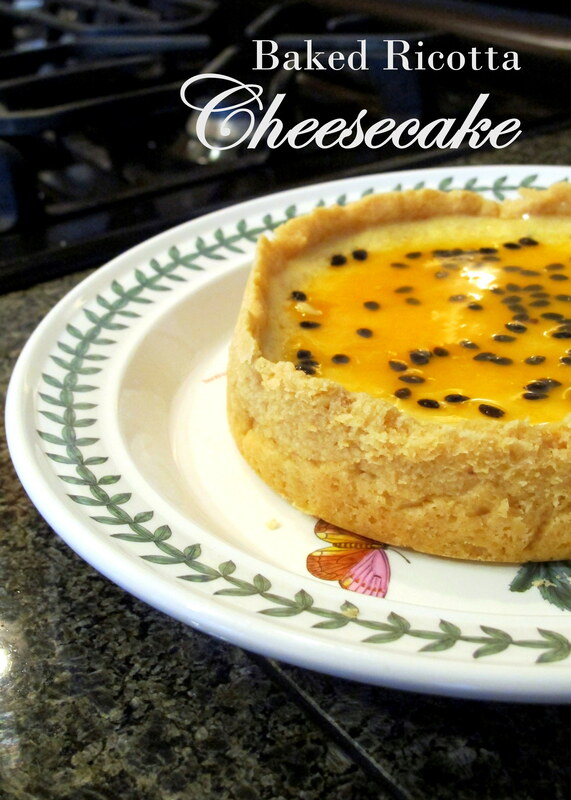 This entry was posted in Cakes, cupcakes & scones, Sweets and Desserts and tagged Aussie, Australia, biscuit crust, blind bake, cake, cheese, cheese cake, cheesecake, cream cheese, dessert, FODMAP, FODMAPS, fructose friendly, fructose malabsorption, fruit, gluten free, home-cooked, homemade, low fructose, nuts, passion fruit, pie, preserves, ricotta, ricotta cheese, strawberry, sweet, vanilla, vanilla bean, vegetarian. Bookmark the permalink. I LOVE baked ricotta cheesecakes but I can understand how they might not be their most popular item. Ev loves ricotta cheese but doesn’t like the texture ricotta gives a cheesecake (he likes them creamy), so *unfortunately,* I have to enjoy these cakes all to myself. 😛 Let me know how yours turn out!